Astronomers estimate that more than two-thirds of all stars have one or more companions to accompany them in their journey through the cosmos. Our sun, however, seems to be going it alone in this regard, for despite an exhaustive search no stellar partner has yet been found. But perhaps we’re better off that the sun is a solitary star, since having two of them in our sky might severely limit our ability to see other celestial wonders that a dark night sky affords. A visual double star consists of two stars that appear to lie in close proximity to each other in the eyepiece of a telescope that is usually seen as a single star to the unaided eye. There are two basic types of these objects—optical doubles and physical doubles. An optical double is the chance alignment of two stars that look like they are near each other, but are actually very far apart in space. When two stars really are neighbors and gravitationally bound to one another, they’re referred to as a physical double, or binary star. Many observers with telescopes derive a great deal of satisfaction from viewing double stars. To professional astronomers, and even amateurs who have the right kind of equipment, there is genuine science to be gained. It turns out that carefully measuring binary stars can yield the total mass of a double-star system. This information is of crucial importance to theorists working on stellar evolution. 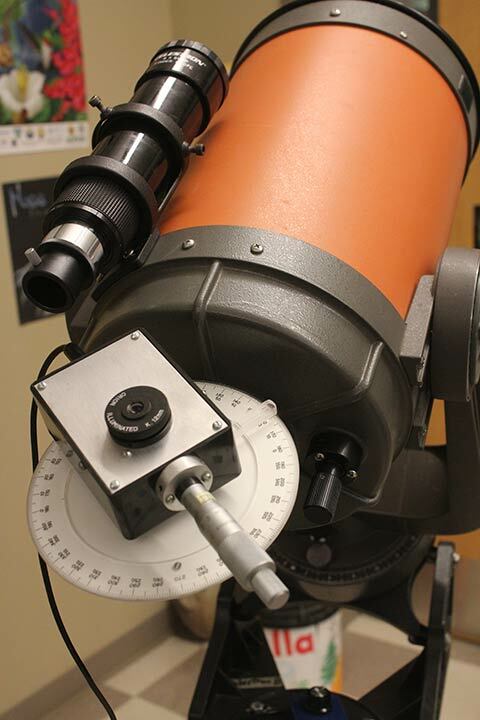 All one needs to measure double stars is a good telescope on a solid, motorized equatorial mount, and an auxiliary piece of equipment called a micrometer. A micrometer is a device that consists of an eyepiece and two parallel thin filaments or threads, one that is fixed while the other can be moved by turning a screw head upon which is marked a finely graduated scale. As it turns out, only two pieces of information are necessary to determine the orbit of a binary star: the position angle and separation of the pair. In double-star lingo, the brighter of the two stars is referred to as the primary, the dimmer as the secondary. The position angle describes the dimmer star’s location with respect to the primary, expressed as the number of degrees from true north. The separation of the two stars is a straightforward measure (in arcseconds) of the apparent distance between them. This is precisely the information that the micrometer was designed to ascertain. When one applies these data to a blend of Newton’s law of gravitation and Kepler’s third law of orbital motion, the mass of the double star system can be calculated. But casually viewing doubles can also be a very rewarding exercise in its own right, as no two pairs are exactly alike. The attributes of particular interest are the separation, relative brightness and color contrast of the two stars. What is the closest stellar separation your telescope can detect? What colors, if any, can you see? DECAPODA (iota Cancri) in the constellation of Cancer: mags: 4.2, 6.6; sep: 30.5; color: gold and blue. ALGEIBA in the constellation of Leo: mags: 2.6, 3.8; sep: 4.5; color: both yellow. COR CAROLI in the constellation of Canes Venatici (just below the handle of the Big Dipper): mags: 2.9, 5.4; sep: 19.6; color: white-to-slightly yellowish. “For some reason the sight of two stars lying very close together is an extremely satisfying one…”, from an article by Henry J. Phillips, entitled Doubles, Binaries and Multiple Stars, Astronomy Magazine, November 1976.